For the Portuguese footballer of the same name, see João Moutinho (footballer, born 1998). This name uses Portuguese naming customs. The first or maternal family name is Iria Santos and the second or paternal family name is Moutinho. João Filipe Iria Santos Moutinho (Portuguese pronunciation: [ˈʒwɐ̃w fɨˈlip iˈɾi.ɐ ˈsɐ̃tuʒ mo(w)ˈtĩɲu]; born 8 September 1986) is a Portuguese footballer who plays for Premier League club Wolverhampton Wanderers and the Portugal national team. Mainly a central midfielder, he can also operate as a defensive or attacking midfielder and on either flank. He began his professional career with Sporting, moving in 2010 to Porto and winning 12 major titles between the two clubs combined. Three years later he transferred to Monaco for €25 million, conquering the Ligue 1 championship in the 2016–17 season. Moutinho represented the Portuguese national team at three European Championships and two World Cups, winning the 2016 edition of the former tournament. Moutinho was born in Barreiro, Setúbal District. After showing great promise as a boy playing for Portimonense SC, he signed with Sporting CP when he turned 13 to continue his football education. During the 2004–05 pre-season, at only 17 years of age, Moutinho was called by manager José Peseiro to the main squad, where he played some games and displayed some talent early on. However, he then returned to the junior team coached by Paulo Bento and featured alongside such players such as Miguel Veloso and Nani, helping the side win the national title that season, although he was also regularly training with the main squad. In the beginning of 2005, Moutinho was called up for a game in the Taça de Portugal, eventually playing 20 minutes against F.C. Pampilhosa, and made his Primeira Liga debut on 23 January, staying in the entire 3–0 win at Gil Vicente F.C. and wearing the #28 shirt previously worn by Cristiano Ronaldo. Based on highly consistent displays, he wasted no time in establishing himself as a regular while being able to play in any position across a flat midfield or in a diamond formation; his box-to-box dynamism and determination quickly made him a firm fan favourite, as he rarely missed a game since becoming first-choice. Moutinho's performances in the closing stages of the campaign, especially in the UEFA Cup with man of the match displays against Feyenoord and Newcastle United that helped the Lions reach the final of the competition, made him an automatic starter for Sporting despite his young age; he contributed with 15 league games as Sporting finished second and, during the summer, he penned a one-year extension with the club. In his first full season, Moutinho's further progress and exceptional consistency (he was the only player to play every minute of every match in the domestic league) was one of the brightest spots in Sporting's runner-up final place. Incidentally, he scored his team's final goal of the campaign, a 1–0 win over S.C. Braga to ensure a return to UEFA Champions League football for the Lisbon club. In 2006–07, following the departure of veteran Ricardo Sá Pinto, Moutinho was made vice-captain at just 19 years of age. The following season, after Custódio and Ricardo also left, he would be named captain, the second youngest in the history of the club's professional football, behind first captain and associate founder Francisco Stromp. That campaign, with Leandro Romagnoli (an attacking midfielder) also in the starting eleven, Moutinho, more often than not, moved from his natural "behind-the-forwards" midfield role to the right flank, where he still managed to deliver impressive performances. Additionally, he began earning plaudits as one of the league's top players. In 2008–09, after an aborted deal with Premier League's Everton, Moutinho was again ever present, only missing three league matches (almost 50 presences overall) as Sporting finished once again runners-up; he also had the dubious distinction of netting his side's only goal in the Champions League round-of-16 clash against FC Bayern Munich, a 1–12 aggregate loss. On 3 July 2010, Moutinho signed a five-year contract with Sporting rivals FC Porto, with the transfer price reaching €11 million (€1M being paid for 50% of the rights to central defender Nuno André Coelho); additionally, Sporting would receive 25% of any added value (Portuguese: mais valia) occurring during that time frame, provided it surpassed the previous value. Sporting Chairman José Eduardo Bettencourt described Moutinho's conduct as deplorable and called him a "rotten apple", adding: "The deal was done because Sporting wanted it, because it did not want a rotten apple in its orchard, and it did not want someone who was not an example, nor dignified the flag of the club." Soon after, Porto sold 37.5% of the player's economic rights to a third party, Mamers BV, for €4,125,000. Moutinho was an ever-present figure for Porto in his first season. He appeared in 50 official games as the northerners won the league and, even though he did not score in league competition, he netted twice in the campaign's Portuguese Cup, most notably in a 3–1 away win against S.L. Benfica, with his team overcoming the 0–2 home loss in the first leg to reach the final, in which the player also appeared, against Vitória de Guimarães (6–2); he added another 90 minutes in the Europa League final, and the club won the treble. On 3 August 2011, Porto partnered with Soccer Invest Fund to buy back 37.5% of Moutinho's economic rights. The private investment fund acquired 15% after the overall transactions, while Porto recouped 22.5% for €4 million; the residual 15% was acquired by Porto in 2013, for €3.3 million. Moutinho scored a rare goal on 19 February 2013, helping his team to a 1–0 home win over Málaga CF for the season's Champions League round-of-16, netting from close range after an Alex Sandro cross (eventual 1–2 aggregate loss). He played 43 contests during the campaign all competitions comprised (five goals, 3,515 minutes of action), as both team and player won their third consecutive league championship. On 24 May 2013, it was announced that Moutinho had joined AS Monaco FC alongside teammate James Rodríguez for a combined fee believed to be around €70 million (€25 million for Moutinho). He made his official debut for his new club on 1 September, starting and setting up both goals in a 2–1 win at Olympique de Marseille which put Monaco to the top of Ligue 1. Moutinho was first-choice in his debut campaign, as the principality team finished runners-up straight out of Ligue 2. His only goal was an equaliser in a 1–1 away draw to Stade de Reims, on 29 September. On 16 September 2014, in Monaco's first Champions League match since 2005, Moutinho scored the only goal in a home defeat of Bayer 04 Leverkusen. He finished the season with 52 overall appearances, in an eventual third-place finish for the Leonardo Jardim-led side. Moutinho contributed with two goals from 31 matches during 2016–17, helping the club to the eighth national championship of its history. On 24 July 2018, Moutinho joined newly-promoted English club Wolverhampton Wanderers on a two-year-deal for an undisclosed fee, reported to be around £5 million. He made his Premier League debut on 11 August, featuring 85 minutes in a 2–2 home draw against Everton. His first goal in the competition arrived on 22 September, when he scored from just outside the box with his weaker left foot in a 1–1 away draw to Manchester United. A full Portugal international at the age of 18, Moutinho made his debut on 17 August 2005 in a 2–0 home friendly win against Egypt in Ponta Delgada. Ever since the 2006 FIFA World Cup, he became a regular call-up. On 31 May 2008, Moutinho registered his first goal for the national team in a 2–0 friendly victory over Georgia at Estádio do Fontelo in Viseu. He was picked for the squad-of-23 for UEFA Euro 2008 and, in the opening game, assisted on a goal by Raul Meireles in a 2–0 victory against Turkey. Moutinho also played in two UEFA European Under-21 Championships, scoring against Germany in the 2006 edition, played on home soil, as the Portuguese exited in the group stage on both occasions; additionally, although not part of the provisional 24-player list for the 2010 World Cup in South Africa, he was named in a backup list of six players. Moutinho played all the games and minutes at the Euro 2012 tournament. In the semi-finals against Spain, he missed his penalty shootout attempt in an eventual 2–4 loss (0–0 after 120 minutes). Moutinho was selected by former Sporting boss Bento for the 2014 World Cup, making his debut in the tournament on 16 June in a 0–4 group stage defeat to Germany. On 8 October 2015, he scored the only goal as Portugal defeated Denmark at the Estádio Municipal de Braga to seal qualification for Euro 2016, and three days later was also on the scoresheet in a 2–1 win away to Serbia which confirmed his team's position as group winners. After six appearances out of a possible seven to help his nation win the European Championships for the first time ever, Moutinho was also picked for the 2017 FIFA Confederations Cup squad by Fernando Santos. In the latter competition, in the final group stage game in Saint Petersburg, he won his 100th cap by playing the full 90 minutes in the 4–0 defeat of New Zealand. Moutinho was included in the 2018 World Cup squad. Moutinho's father, Nélson, was also a footballer. A forward, he played for several clubs during a 15-year senior career. ^ Includes Taça de Portugal, Coupe de France and FA Cup matches. ^ a b "FIFA Confederations Cup Russia 2017: List of players: Portugal" (PDF). FIFA. 20 March 2018. p. 7. Retrieved 29 March 2018. ^ a b "João Moutinho em "chat" no Maisfutebol: revelações fora dos relvados" [João Moutinho chat on Maisfutebol: revelations outside the field] (in Portuguese). Mais Futebol. 23 February 2006. Retrieved 10 July 2018. ^ "2018 FIFA World Cup Russia – List of Players" (PDF). FIFA. 4 June 2018. Retrieved 19 June 2018. ^ Tiago Silva Pires (19 March 2005). "Um dia especial para o clã Moutinho" [A special day for the Moutinho clan]. Diário de Notícias (in Portuguese). Retrieved 24 July 2018. ^ "João Moutinho celebra 2 anos de carreira" [João Moutinho celebrates 2 years in career]. Record (in Portuguese). 5 January 2007. Retrieved 24 July 2018. ^ "A vez de Moutinho" [Moutinho's turn]. Record (in Portuguese). 23 January 2005. Retrieved 16 October 2015. ^ a b c "João Moutinho. O indispensável que faz os outros brilhar" [João Moutinho. The untouchable who makes others shine]. Diário de Notícias (in Portuguese). 17 May 2016. Retrieved 24 July 2018. ^ "João Moutinho: "Jogo correu-me bem"" [João Moutinho: «Match went well for me»]. Record (in Portuguese). 25 February 2005. Retrieved 24 July 2018. ^ "Sporting-Newcastle, 4–1: Uma noite histórica deu a vitória aos melhores" [Sporting-Newcastle, 4–1: Historical night gave win to the best]. Record (in Portuguese). 15 April 2005. Retrieved 24 July 2018. ^ "Um campeonato para Moutinho" [A championship for Moutinho]. Record (in Portuguese). 6 May 2006. Retrieved 16 October 2015. ^ Filipe Escobar de Lima (22 October 2006). "João Moutinho, o símbolo pós-Ronaldo" [João Moutinho, the post-Ronaldo symbol]. Público (in Portuguese). Retrieved 24 July 2018. ^ "João Moutinho: "Queremos mostrar o que valemos"" [João Moutinho: "We want to show our worth"]. Record (in Portuguese). 12 June 2007. Archived from the original on 19 November 2015. Retrieved 16 October 2015. ^ "Moutinho: "Culpa é da equipa por permitir remate"" [Moutinho: "Team is to blame for allowing shot"]. Record (in Portuguese). 25 February 2008. Retrieved 16 October 2015. ^ "Comunicado João Moutinho" [João Moutinho announcement] (PDF) (in Portuguese). FC Porto. 5 July 2010. Archived from the original (PDF) on 13 August 2010. Retrieved 6 July 2010. ^ "Bettencourt: "Uma maçã podre que iria contaminar o grupo"" [Bettencourt: "A rotten apple that would contaminate the group"]. Record (in Portuguese). 5 July 2010. Retrieved 24 June 2017. ^ "Report and consolidated accounts 2009/2010" (PDF). FC Porto. 25 October 2010. Archived from the original (PDF) on 25 January 2011. Retrieved 18 May 2011. ^ "Também o Jamor é o destino do FC Porto" [Jamor is FC Porto's destiny as well]. Público (in Portuguese). 22 May 2011. Retrieved 24 March 2018. ^ "Falcao doet Porto zegevieren in Europa League" [Falcao makes Porto prevail in Europa League] (in Dutch). Sporza. 18 May 2011. Retrieved 24 March 2018. ^ "Comunicado" [Announcement] (PDF) (in Portuguese). FC Porto. 3 August 2011. Archived from the original (PDF) on 24 December 2011. Retrieved 12 August 2011. ^ "Comunicado" [Announcement] (PDF) (in Portuguese). FC Porto. 30 January 2013. Archived from the original (PDF) on 23 September 2013. Retrieved 2 June 2013. ^ "Moutinho earns Porto the edge". UEFA. 19 February 2013. Retrieved 24 February 2013. ^ "Monaco pay €70 million for Porto pair". Goal. 24 May 2013. Retrieved 24 May 2013. ^ "Riviere confirms Monaco win". Sky Sports. 1 September 2013. Retrieved 16 September 2014. ^ "Reims 1–1 Monaco". Goal. 29 September 2013. Retrieved 16 September 2014. ^ McGee, Nicholas (16 September 2014). "Monaco 1–0 Bayer Leverkusen: Moutinho marks winning return for Monaco". Goal. Retrieved 16 September 2014. ^ "Ligue 1: le huitième titre de champion de France de Monaco passé au crible" [Ligue 1: Monaco's eighth French champions title under the magnifying glass] (in French). France Football. 17 May 2017. Retrieved 23 July 2018. ^ "Joao Moutinho: Wolves sign Portugal midfielder from Monaco". BBC Sport. 24 July 2018. Retrieved 24 July 2018. ^ Shamoon Hafez (11 August 2018). "Wolverhampton Wanderers 2–2 Everton". BBC Sport. Retrieved 14 August 2018. ^ Alex Bysouth (22 September 2018). "Manchester United 1–1 Wolverhampton Wanderers". BBC Sport. Retrieved 22 September 2018. ^ "João Moutinho silencia Old Trafford com tremendo remate... de pé esquerdo" [João Moutinho silences Old Trafford with tremendous shot... with left foot]. Record (in Portuguese). 22 September 2018. Retrieved 22 September 2018. ^ "Postiga on target for Portugal". UEFA. 18 August 2005. Retrieved 8 September 2014. ^ "Convocados revelados" [Squad revealed] (in Portuguese). Portuguese Football Federation. 10 May 2010. Archived from the original on 15 June 2011. Retrieved 11 May 2010. ^ "Pepe in Portugal squad". FIFA. 10 May 2010. Retrieved 11 May 2010. ^ "Spain survive test of nerve to reach final". UEFA. 27 June 2012. Retrieved 28 June 2012. ^ "Portugal World Cup 2014 squad". The Daily Telegraph. 2 June 2014. Retrieved 26 June 2014. ^ "Muller-inspired Germany thrash ten-man Portugal". FIFA. 16 June 2014. Retrieved 26 June 2014. ^ "Moutinho magic seals Portugal progress". UEFA. 8 October 2015. Retrieved 9 October 2015. ^ Nikčević, Sonja (11 October 2015). "Moutinho magic seals top spot for Portugal". UEFA. Retrieved 11 October 2015. ^ "Portugal name Bayern Munich signing Renato Sanches for Euros squad". ESPN FC. 17 May 2016. Retrieved 24 June 2017. ^ a b "Portugal 1–0 France". BBC Sport. 10 July 2016. Retrieved 24 June 2017. ^ "Éder fica fora dos convocados, Beto e José Sá nas escolhas" [Éder out of squad, Beto and José Sá picked]. O Jogo (in Portuguese). 25 May 2017. Retrieved 24 June 2017. ^ "Portugal cruise into semi-finals". FIFA. 24 June 2017. Retrieved 24 June 2017. ^ "Moutinho e as 100 internacionalizações: "Espero jogar ainda mais"" [Moutinho and the 100 caps: "I hope to play even more"]. O Jogo (in Portuguese). 24 June 2017. Retrieved 24 June 2017. ^ "Nearly half Portugal's Euro squad to miss World Cup". Special Broadcasting Service. 17 May 2018. Retrieved 17 May 2018. ^ "O 'olheiro' de craques da seleção" [The 'scout' of national team stars] (in Portuguese). Visão. 30 June 2012. Retrieved 9 October 2015. ^ "Alexandre Moutinho segue pisadas de João" [Alexandre Moutinho follows in João's footsteps]. Record (in Portuguese). 22 June 2015. Retrieved 9 October 2015. ^ a b c d e f g h i "João Moutinho". ForaDeJogo. Retrieved 17 February 2015. ^ a b c d e f "João Moutinho". Soccerway. Retrieved 17 February 2015. ^ a b "João Moutinho". European Football. Retrieved 16 September 2014. ^ "Swashbuckling Monaco end 17-year French title wait". UEFA. 17 May 2017. Retrieved 18 May 2017. ^ "Monaco 1–4 PSG: Les Parisiens claim fourth successive Coupe de la Ligue as Edinson Cavani scores twice". Daily Mirror. 1 April 2017. Retrieved 18 May 2017. ^ ""Portugal fez uma prova excelente", diz Fernando Santos" ["Portugal had an excellent tournament", Fernando Santos says] (in Portuguese). TSF. 2 July 2017. Retrieved 4 July 2017. ^ Ricardo Gouveia (24 May 2016). "Moutinho e o exemplo dos sub-17: "Espero que seja um bom presságio"" [Moutinho and the under-17s example: «I hope it's a good omen»] (in Portuguese). Mais Futebol. Retrieved 24 July 2018. ^ "João Moutinho eleito o "jogador do mês" pelo Sindicato" [João Moutinho voted «player of the month» by Union] (in Portuguese). Mais Futebol. 9 May 2005. Retrieved 24 July 2018. ^ "Moutinho é o jovem do mês" [Moutinho is youngster of the month]. Record (in Portuguese). 3 April 2008. Retrieved 24 July 2018. ^ "Kelvin eleito atleta jovem do ano" [Kelvin voted young athlete of the year]. A Bola (in Portuguese). 29 September 2012. Retrieved 29 September 2013. ^ "Seleção recebe insígnias de Marcelo no Porto" [National team receives insignia from Marcelo in Porto]. Diário de Notícias (in Portuguese). 25 August 2016. Retrieved 11 August 2017. 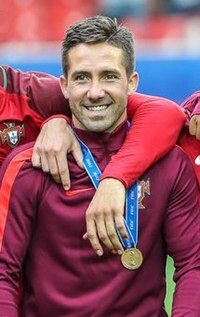 Wikimedia Commons has media related to João Moutinho.